When you walk into my bedroom, the wall above the bed is the first thing you see. I wanted to create a fun display - something that would have more visual impact than a mirror or picture. I'd always loved picture frame displays, so I decided to go with that. I went to the dollar store and bought several frames in different sizes and shapes. I have eleven frames, so that cost $11. Removed the glass and backing and sprayed them all with white spray paint. I spread them out on my bed and rearranged them until I found an arrangement that pleased me. 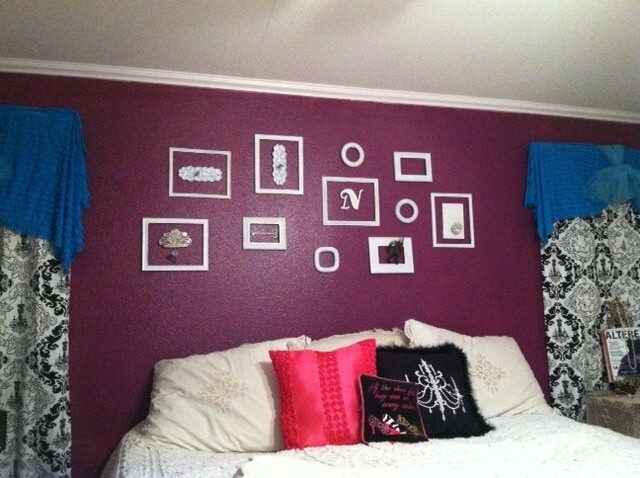 Starting with the middle frames I nailed them onto the wall, maintaining the correct spaces between them. The frames alone on the wall looked too flat and one-dimensional, so I looked around my house for things to fill the frames. The initial 'N', a coat hook, an old key, a peacock corsage that I had worn at my son's wedding. I picked up a couple more things at Hobby Lobby to finish out the look I wanted. I kept a few of the frames empty so that it didn't look too cluttered. Here is the final result. I am very happy with how it turned out. It adds a touch of whimsy to the room which I love. Cute cute cute! I love the paint color too! Thanks for linking up this week at Thrifty Thursday!